QL server is the backend application for “on premise” hosting. It’s running on a Microsoft Windows IIS server(s) and a Microsoft SQL database. 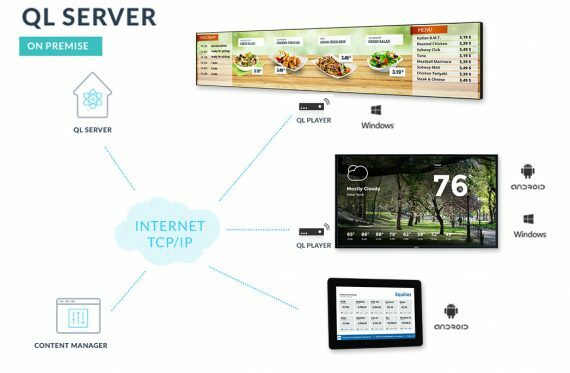 This digital signage software component centralizes all content manager users and players. NAVORI QL WAS DESIGNED FOR NETWORKS THAT REQUIRE COMPLETE ISOLATION BETWEEN MULTIPLE TENANTS. The platform lets administrators assign each tenant their own domain ensuring users can only see their own group/sub-group hierarchy. The system is secure, reliable and features a wide range of user access controls which are essential to any network operator. QL administrators are in complete control of the network. Create user accounts that have a predefined expiry date. Users can be locked out at any time. Fully programmable user rights. Create group specific administrators, managers and user accounts. Assign and manage user IP restrictions (up to 10 static IPs can be assigned per user account). E.g. user can log in to the system from his office but not from home. This type of control is essential for business applications. Control access by group or individual sub-group(s). Root level administrators are in total control of what users can see and access on the system. Grow your network at your own pace. Start on a Windows 7 based PC with SQL Server Express and upgrade later to a Windows Server/commercial SLQ Server license later on. QL is optimized for growth. Each QL Player collects and processes its own proof of playback reports, then uploads them to the Server. QL Server integrates individual reports into a central database. Adding large numbers of Players will have minimal impact on the Server. Navori QL data backup and migration is quick and painless. Key benefits: Ease of use/administration. Powerful profile based user and player property management. Designed for growth. Extremely scalable.